The Uzbekistan Forum draws together scholars of Uzbekistan who have studied the country’s social, political, economic, agrarian and religious life over many years and who have published on these themes in the pages of Central Asian Survey. In a spirit of timely scholarly contribution to public debate, contributors were given an open brief to write short, personal essays drawing on their own area of scholarly and disciplinary expertise, exploring how these could help illuminate Uzbekistan’s present and near future. All of the contributions were penned within two weeks of Karimov’s funeral on September 3rd 2016 and are artefacts of that moment. It is symptomatic of the secrecy that surrounded Karimov’s death, as well as his life, that even the date of his passing is disputed among the short essays that follow. The perspectives and voices that appear in this Forum are as diverse as one would expect from the contributors to a scholarly journal located across three continents. Nonetheless, certain recurrent themes emerge: the need to take history seriously; a scepticism towards scenarios positing sudden change; the need to understand the Uzbek model of mustaqillik seriously in its own terms, particularly as this pertains to the country’s protectionist model of economic development and its foreign policy trajectory. Perhaps the most striking continuity in assessment across the various contributions concerns the degree to which the post-Karimov political elite is invested in continuing the system of patrimonial privilege that has developed over the preceding twenty-five years. Readers are invited to explore these contributions in the spirit intended: as personal and sometimes speculative reflections at a critical moment of transition. These ‘think-pieces’ are coupled with a Virtual Special Issue that brings together a number of the journal’s recent articles on Uzbekistan (published 2010-2016), made free-to-access to the end of the year. 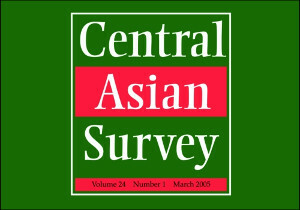 In this way, it is hoped that Central Asian Survey can play some role in bringing the insights of long-term, empirically grounded and theoretically-informed scholarship to public debate on contemporary Uzbekistan. Madeleine Reeves is a Social Anthropologist at the University of Manchester and Editor of Central Asian Survey. What is the legacy left to Uzbekistan by Islam Karimov?